That’s right…I’ve finished university! Just results and graduation to go. So I’ll tell you a little about my final year. Third year is dominated by your third year project. It’s worth 25% of your entire degree so getting it right it important. The rest of third year is worth 50% and second year is worth the remaining 25%. At the end of second year (or your industrial placement year) there will be a list of projects available for you to choose from. You submit your top preferred choices and the school will do it’s best to accommodate you. If possible, choose a project supervised by a lecturer you know, get along with or are on the same ‘wavelength’. The relationship you have with your supervisor is likely to influence your project; it will affect how easily you make progress in meetings, how comfortable you are discussing any problems and how enthusiastic your supervisor is to help (i.e. if you show no interest, they are unlikely to go out of their way if needed). Obviously, you should choose a project you are interested in. Make sure it is something that will hold your attention for as long as possible. If you find it fun to work on you’re likely to achieve better results. To aid the above, you can suggest your own project. The school will address its suitability and, if successful, assign you a supervisor. Further still, you can approach a lecturer yourself and ask them to be your supervisor. To do this, it’s helpful to have some sort of idea for a project and it really should be in the lecturers area of research. So this is what I choose to do. I knew I wanted to do something in the area of machine learning, so I approached the lecturer who taught me Machine Learning in the second year, Dr. Gavin Brown. I only had a very flimsy suggestion involving a neuroheadset and trying to predict the thoughts (i.e. between a square and a circle) of the wearer. It’s worth remembering that a successful project doesn’t mean that what you create has to work. For example, if it turned out that I couldn’t ‘read someone’s mind’, I would have just had to make sure I could explaine my research and findings. I didn’t really have any idea about biology and decided the project would be too difficult in the timescale. Despite this, Gavin agreed to supervise me as he was confident we could come up with a project idea. 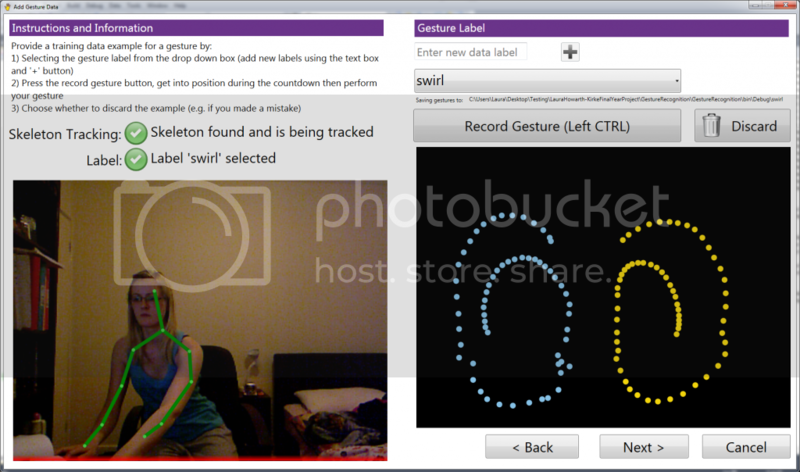 A few weeks later I suggested what came to be my actual project, ‘Gesture Recognition using Microsoft’s Kinect’. My project was lots of fun, but challenging. 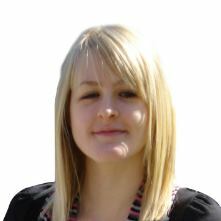 It involved quite a bit of mathematical research, learning a new language (C#) and getting to grips with the Kinect SDK. I created a wizard which, at it’s heart, allows the user to input new gestures and, upon repeating a certain gesture, predict what was performed. It monitors all the joints in the body, but the swirls on the right are from the right and left hands. Another thing you will get told over and over is to start your project early. Listen to them! Do as much as you can in first semester, specifically in the first few weeks when other workload is low, because coming up to Christmas and second semester your time will be interrupted by job applications, exams and your final project demo (which sneaks up quickly!). I regret not working more early on. Ideally, start your project during the summer holidays. I know someone who did this, who started their project report (10000 – 14000 words) months before everyone else. He had a much less stressful final year as you can imagine. Also, expect your project plan to go wrong. You’ll get stuck with some problem and you need to have spare time allocated to deal with it. I know of very few people who stuck to their original plan. Those who did, generally had a project with clear, defined endpoints (unlike my project where I wasn’t sure what I would end up creating or what it involved). Don’t forget, you have other course units as well as your project. I really enjoyed AI and Games, which span both semesters including a project in each. Each group in the first group project had to create a bot that played the game mankalah to compete against each other in a large tournament. You are able to choose your own team and working with your friends is great fun. The competition between groups of friends also makes you more inclined to work on the project. The second semester project involves a common economic problem about learning and predicting the price of goods between suppliers. It is on a smaller scale than the first project, which is welcomed during the manic second semester. I also really enjoyed Compilers, Understand Programming Language (warning: maths and memory!) and found Cryptography and Network Security really useful. I kept my role on the SSCC (Student-Staff Consultative Committee) and hopefully gave the school some useful insight into the degree course from my fellow students. The CSSC (Computer Science Social Committee) continued to organise events (I went to laser quest for the first time) and designed and produced school hoodies. Overall, I unfortunately found third year less social. Less contact hours are required with the school (i.e. less lectures and lab sessions) because time is allocated for the third year project and I needed to be on my own computer at home to work on it. I preferred second year because everyone was around all the time, working in labs between lectures. But that’s not to everyone’s taste as they can get easily distracted. I think that’s it. I’ll probably write another post about graduation in a few weeks and then I am officially not a student anymore. Bring on my graduate job at the BBC! In case this turns out to be my final post, I am happy to answer any questions etc. You can contact me through my personal blog – now that uni is over I should have more time to keep it up-to-date!